Made for the stage: The incredible life and career of dancer and dramatic actress Ida Rubinstein … and her 20-year collaboration with French composer Florent Schmitt. In every era, there are always a few people in the arts whose life and career seem like something out of a movie or novel. Such a characterization is wholly apt in the case of dancer and dramatic actress Ida Rubinstein, the Russian-Jewish femme fatale who commanded the limelight in Paris for nearly half a century. 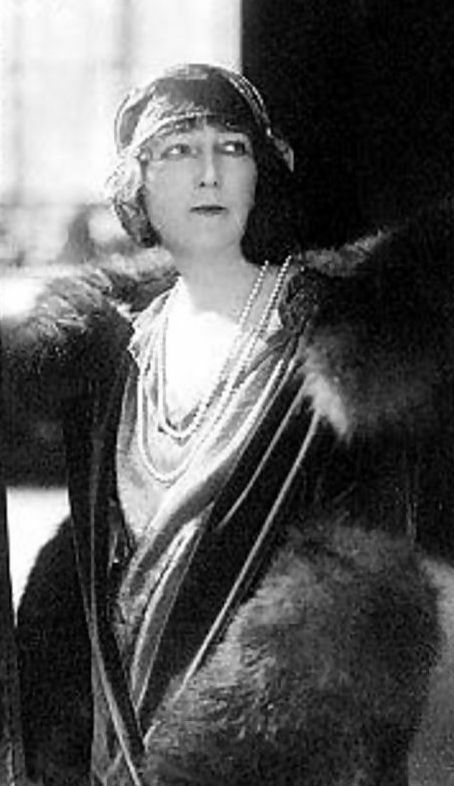 Born in 1885 (some sources reference her birth year as 1883) into a fabulously wealthy sugar, brewery and banking family from the Ukrainian city of Kharkov — at the time part of the Russian Empire — Lydia Lvovna Rubinstein was orphaned shortly thereafter. But the lucky child was raised in St. Petersburg by relatives who were firmly integrated into the social fabric of the Imperial Capital. From a very early age, Rubinstein exhibited a flair for the theatrical, always going by the name “Ida” instead of her given name. Her arts-loving family ensured maximum exposure to the cultural activities of the city. Traveling to Greece as a young woman inspired her to pursue the theatre with even greater intensity. Rubinstein met and began working closely with theatrical designer and artist Lev Rosenberg (later known as Léon Bakst) to stage a private showing of Sophocles’ ancient Grecian play Antigone. This marked the beginning of her career as a dramatic actress — as well as the beginning of what would turn out to be a lifelong friendship with the soon-to-be-world famous set and costume designer. 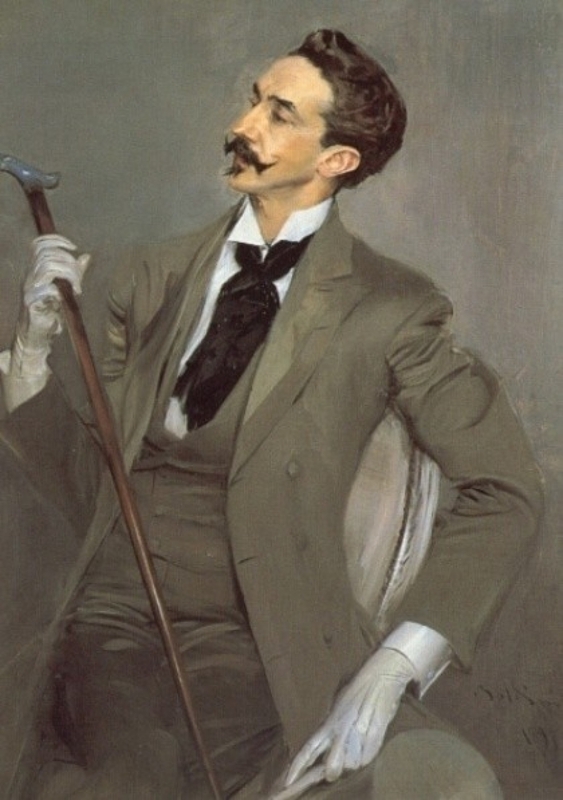 Through Bakst, Rubinstein was introduced to other important artistic figures of the day in Imperial Russia, including the impresario Serge Diaghilev and the choreographer Mikhail Fokine. Both men would prove to be very instrumental in her later international success. 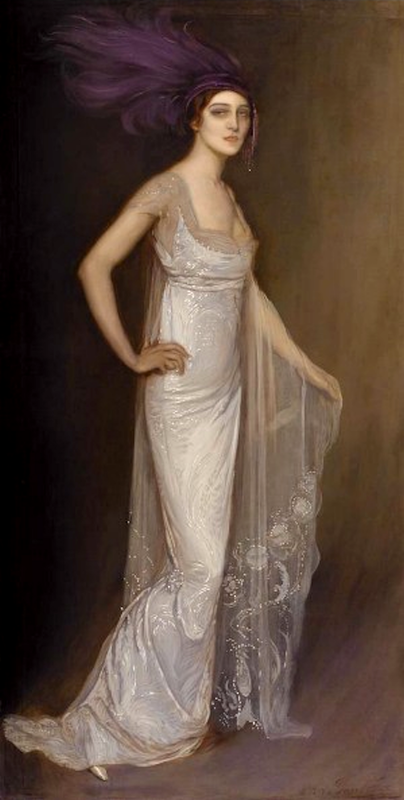 In 1907, Rubinstein married a cousin, thereby gaining control of her inheritance as well as the social independence she craved; the marriage appears to have been one of convenience. Following a second private theatrical production in St. Petersburg — this one roundly criticized by government censors — Rubinstein joined up with Serge Diaghilev in 1909 when he formed his Ballets Russes troupe for its first Paris season. In the inaugural Paris season, Rubinstein’s dancing thrilled audiences in such ballet productions as Cléopâtre (set to the music of Arensky, Glinka, Mussorgsky and Glazunov), which included a notorious disrobing scene that surely set tongues wagging throughout the city. 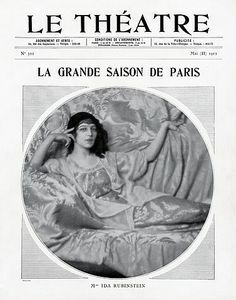 The talk of the town: Ida Rubinstein on the front cover of a Parisian theatre magazine, 1912. A veritable “who’s who” of Paris artistic society attended the season; in addition to Florent Schmitt, key luminaries seen in the audience each night included Claude Debussy, Maurice Ravel, Isadora Duncan, Auguste Robin, José-Maria Sert, Jean Cocteau and many others. Rubinstein’s Paris debut was so noteworthy, she soon had the opportunity to dance in London (at the Coliseum), in Italy, and even at the Metropolitan Opera in New York. 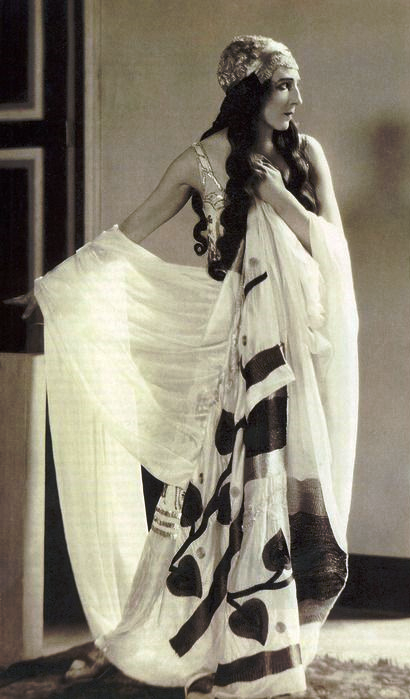 Even greater success came in 1910 when Rubinstein danced the part of Zobéïde in the Ballets Russes production of Rimsky-Korsakov’s Scheherazade — widely admired at the time for its sumptuous staging and frank sensuality. In the audience that season were Pablo Picasso, Sarah Bernhardt, and Count Robert de Montesquiou-Fézensac, a Symbolist poet, aesthete and patron of the arts who would become Ida Rubinstein’s indefatigable social champion during the next decade. 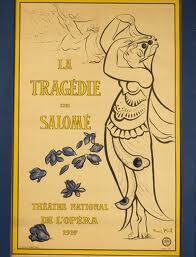 In the run-up to World War I, Rubinstein would open a Paris studio where she prepared theatrical productions such as Oscar Wilde’s Salome (in Wilde’s own original French manuscript) and several productions featuring libretti by the Italian journalist, playwright and poet Gabriele D’Annunzio. One of these in particular is interesting in how it presaged Rubinstein’s practice of commissioning music from contemporary composers for her new stage works. 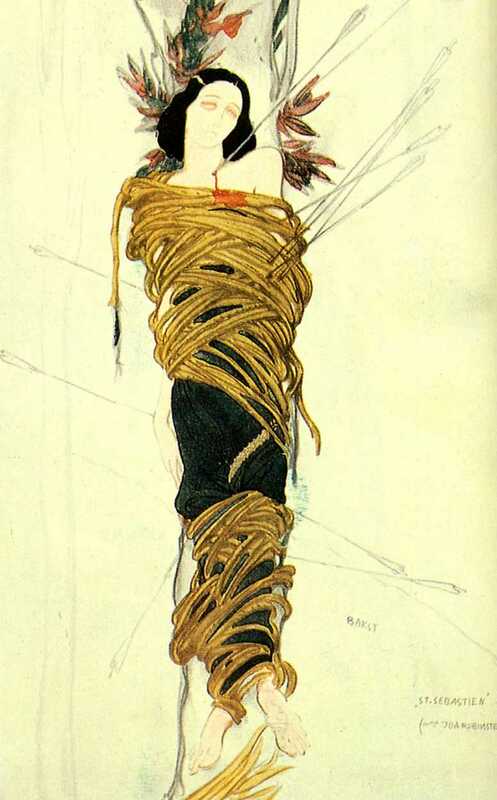 It was D’Annunzio’s production of Le Martyre de Saint-Sébastien, set to new music by Claude Debussy with choreography by Fokine and costumes by Bakst. Its premiere was controversial, with Rubinstein — a Jewish woman — playing the part of Sebastian, a Christian man (and a saint to boot). The Archbishop of Paris went so far as to issue a pastoral letter condemning the work as “offensive to the Christian conscience,” and forbidding French Catholics from attending performances under penalty of excommunication. With the onset of war, Ida Rubinstein, like many other musicians, artists and authors, volunteered for the war effort — but in her own theatrical way. In her specially tailored nurse’s uniform (designed by Bakst), not only did she attend to wounded soldiers, she traveled the country, reciting poetry from Count de Montesquiou’s Offrandes blessées. 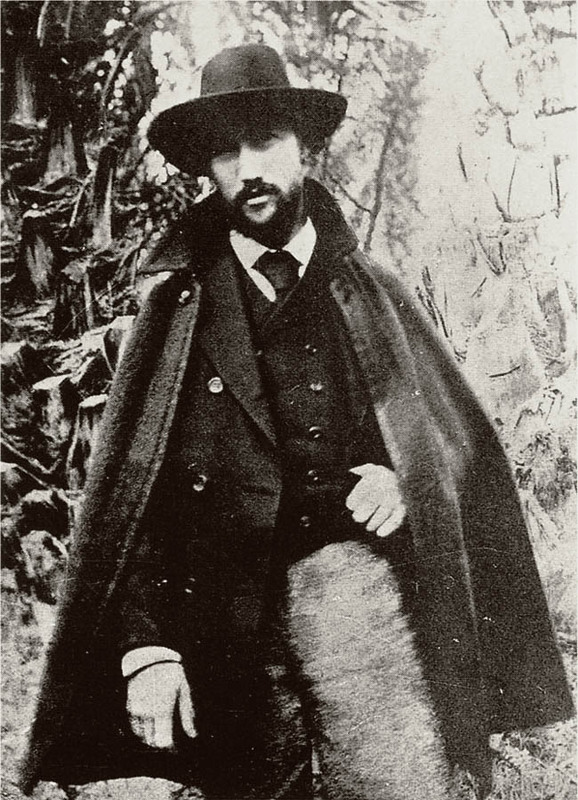 French author André Gide (1869-1951), photographed in 1893. Schmitt composed the incidental music for Gide’s adaptation of Shakespeare’s play. Towards the end of the war, Rubinstein began working with André Gide on a new French production of Shakespeare’s play Antony & Cleopatra. “I dive into the translation … with rapture,” Gide reported in his diary in April 1917. By November it was completed, and Gide read it to Rubinstein in the company of Bakst, who was to design and produce the sets and costumes. It was Bakst who suggested retaining Igor Stravinsky to compose incidental music for the play — much in the way that Debussy had written musical numbers for Saint-Sébastien. 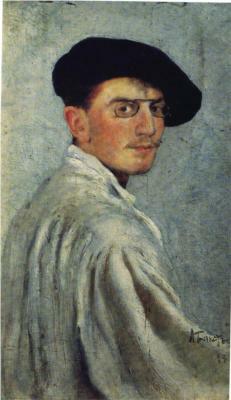 In response, Bakst noted the “recent, bitter failure” of another production that had been designed in a neo-primitivist style. “If Shakespeare’s masterpiece had to be portrayed in the same ‘progressive’ terms, obviously I would have to do without the honor and pleasure of your collaboration,” Bakst wrote. In the event, Rubinstein withdrew her substantial financial offer of 25,000 Swiss francs, and turned to another composer — Florent Schmitt. Why Schmitt? Two reasons, probably. 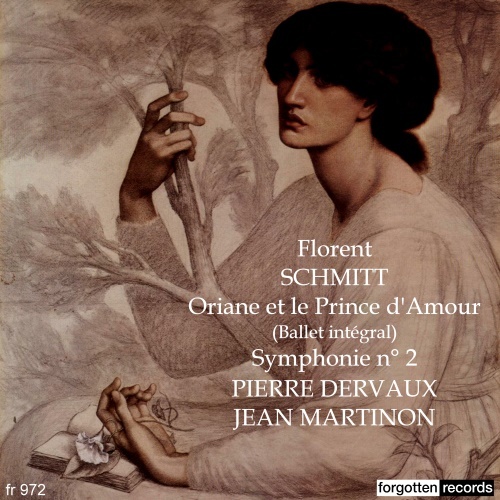 First, at this time Florent Schmitt was considered not only the foremost “orientalist” composer in France, but in the entire world. In order to exemplify and augment the lush exoticism that Gide, Bakst and Rubinstein envisioned for the production, Schmitt’s score would undoubtedly contribute mightily to the overall effect. A poster from the 1919 production of La Tragédie de Salomé, featuring Ida Rubinstein in the title role. 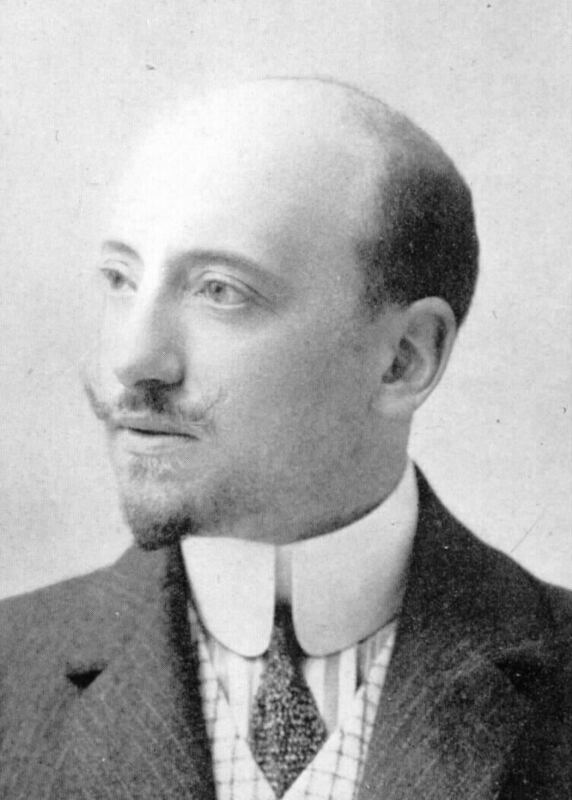 The second reason is that Rubinstein had recently danced the leading role in Schmitt’s popular ballet La Tragédie de Salomé, which had had its stage premiere in 1907 with several other successful Paris productions thereafter (in 1912 with Natalia Trouhanova, and a 1913 Ballets Russes production featuring Tamara Karsavina in the title role). The 1919 production starring Rubinstein, with new choreography by Nicola Guerra, was likewise a strong success. In the process the two artists had developed a mutually rewarding working relationship. That same year, Rubinstein decided to commission Schmitt to compose the incidental music for her next big production. 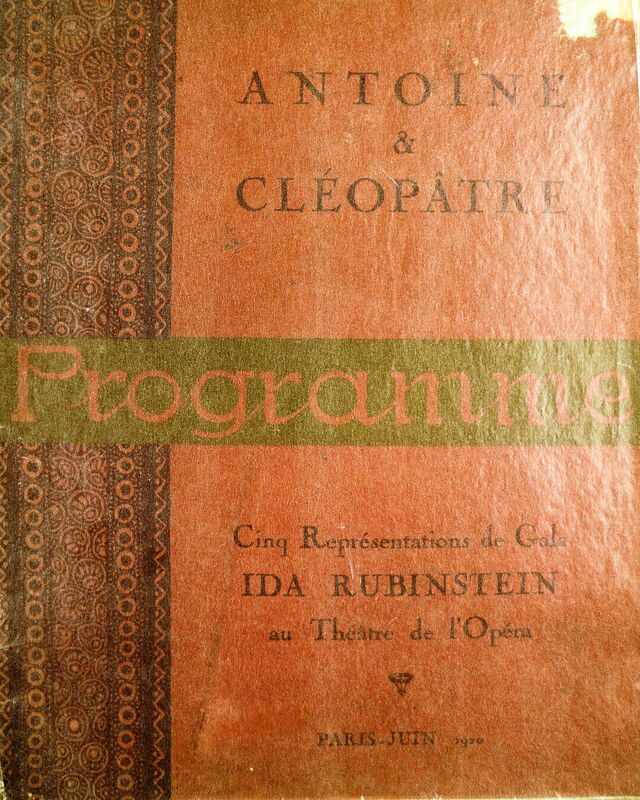 The program booklet for the Gide/Rubinstein production of Antony & Cleopatra (1920). 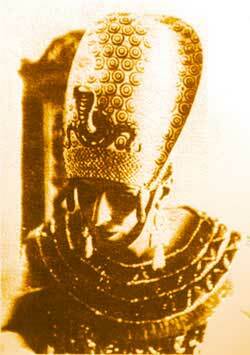 Antony & Cleopatra came to the stage in 1920. True to form, it was a gala spectacular at the Paris Opéra that spared no expense. Bakst’s original conception of ten pieces of incidental music had been reduced to six. Even so, between the music and the play itself, the production went into the wee hours of the morning. Ida Rubinstein as Cleopatra in the Gide/Schmitt production (Paris, 1920). Despite the lavish production values, which included not only Rubinstein but also the famed Edouard de Max in the starring roles along with sets by Bakst and costumes by Jacques Drésa (Rubinstein’s costumes prepared by no less than Maison Worth), Antoine et Cléopâtre would run for just five performances. 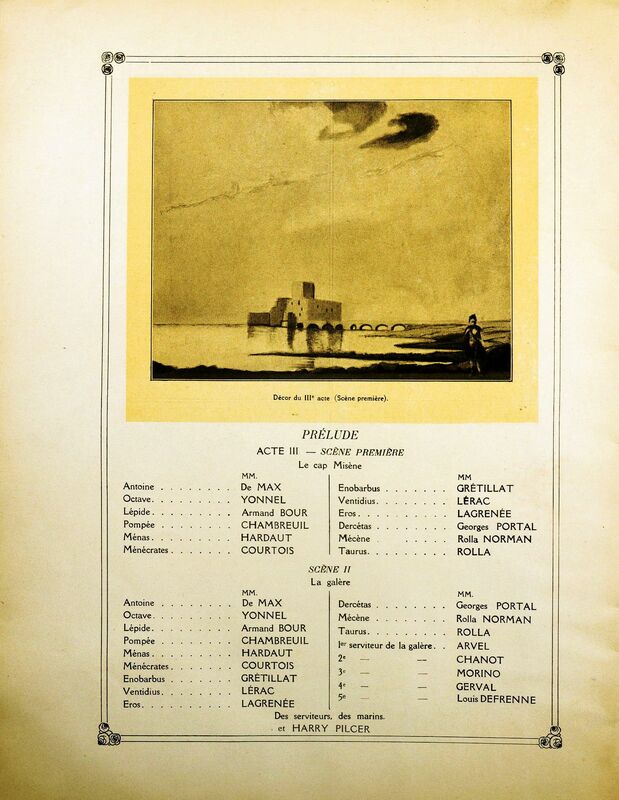 A page from the program booklet for the Gide/Rubinstein production of Antony & Cleopatra (1920). Salvaging the music, Schmitt prepared two concert suites from the incidental music, which were published by Durand as the composer’s Opus 69. 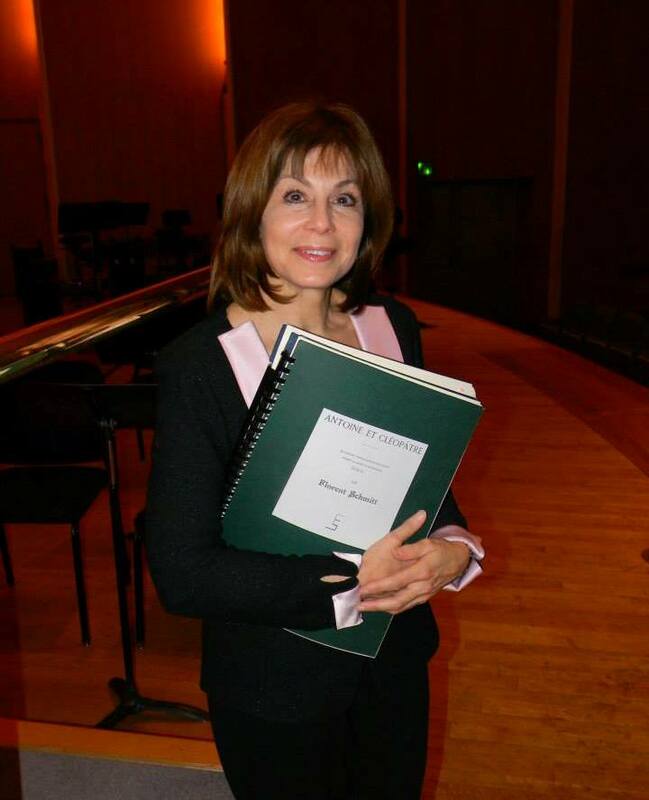 Conductor JoAnn Falletta with the scores to Florent Schmitt’s Antoine et Cléopâtre suites. The music is unquestionably remarkable. The American conductor JoAnn Falletta, whose Buffalo Philharmonic recording of the two suites is due for release on the NAXOS label in November 2015, considers it to be among Schmitt’s greatest masterpieces — on par if not superior to the composer’s far more famous Salomé and Psalm 47. 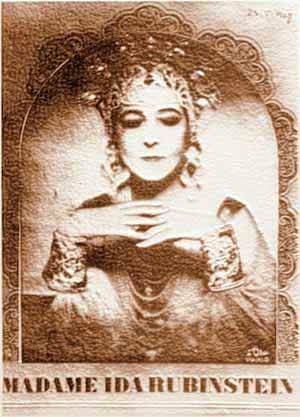 Equally important, Rubinstein’s production of Antony & Cleopatra marked the launch of her own ballet company, Les ballets Ida Rubinstein. Over the course of the next two decades, in addition to reviving ballets such as Stravinsky’s Firebird and d’Indy’s Istar, Rubinstein would produce and star in more than a dozen completely new stage works, featuring music written by some of the best composers working on the Paris scene. 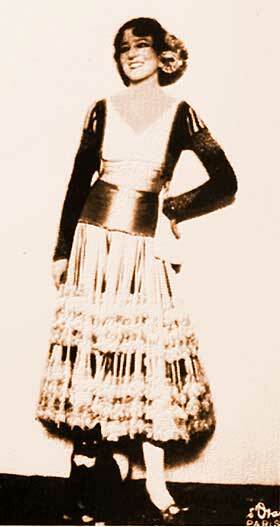 Ida Rubinstein, costumed for the premiere staging of Ravel’s Boléro (1928). Ida Rubinstein as Phèdre, set to the music of Ildebrando Pizzetti (1923). And notice … bookending the list are stage productions with music composed by Florent Schmitt. Regarding Oriane et le Prince d’Amour, the second collaboration between Schmitt and Rubinstein, the manner in which the composer came to learn of the commission is amusingly recounted in Vicki Woolf’s biography of Ida Rubinstein, Dancing in the Vortex. In it, the author quotes Schmitt in his own words. “It was a beautiful summer afternoon. I was in Artiguemy lying under the apple trees facing an incomparable southern peak untouched by snow – completely at peace, thinking no evil thoughts – when a sound like an earthquake shattered the quiet. A motor car, foolishly tackling the goat path, had smashed itself around a great oak and hurled its two lady passengers onto the ground. The set for Florent Schmitt’s ballet Oriane et le Prince d’Amour, staged in 1938. And what a ballet it was: A nearly hour-long production in two acts and four scenes, the story line went several steps beyond the “passion and blood” of even Salomé, Cléopâtre and Salammbô, Schmitt’s other major “orientalist” frescoes. 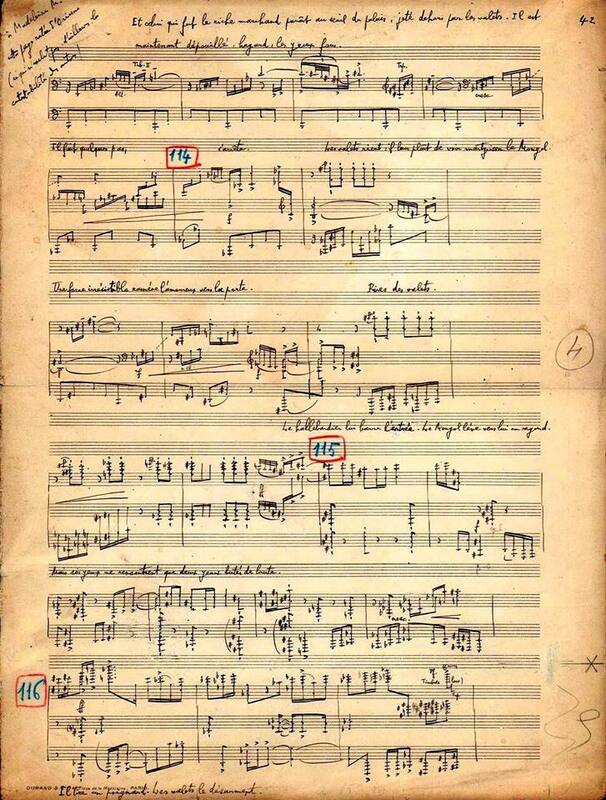 A page from Florent Schmitt’s manuscript score for Oriane et le Prince d’Amour, showing the composer’s characteristically meticulous penmanship. The musical forces called for in the production were every bit as sumptuous as the costumes and scenery — requiring a tenor soloist in addition to a large mixed chorus and full orchestra. A portrait from the 1928 season booklet for Les Ballets Ida Rubinstein, which premiered an astonishing number of new stage works by Honegger, Milhaud, Ravel, Sauget and Stravinsky in a single season. 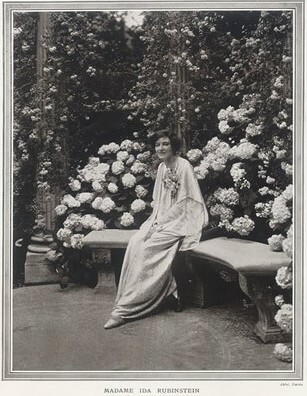 Ida Rubinstein, photographed in the gardens of her home across from the Place des États-Unis in Paris (1925). Each was made a Chevalier of the Legion of Honor in the 1930s. Each artist was blessed with having access to ample financial resources, thanks to family money and wealthy benefactors. And each enjoyed the finer things in life — international travel, fine food, stylish clothes and impressive homes. 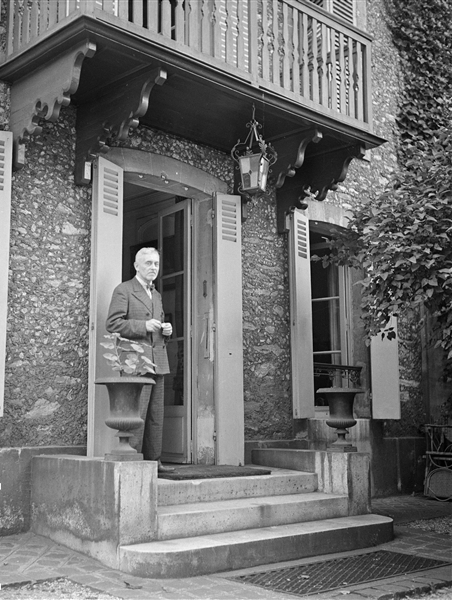 Florent Schmitt’s home from 1920 onwards, a mansion and surrounding gardens in fashionable St-Cloud (even today, the city in France with the second highest per capita income level), was the scene of many social get-togethers with like-minded artists and dignitaries, while Rubinstein’s 1921 move to a lavish new residence across from the Place des États-Unis (designed by Bakst), would be her home until leaving Paris at the onset of World War II. A photograph of Ida Rubinstein taken shortly before World War II. The Second World War would prove to be challenging for both artists. For Schmitt, it was a time when he spent most of his days at his country retreat in the Pyrenees Mountains, returning to Paris mainly to attend concerts of his music. 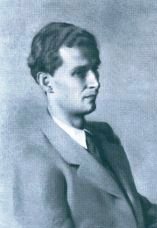 At the end of the war, the 75-year-old composer was questioned by the French government for suspected “collaboration” with the Vichy France regime. The result of the investigation was a one-year suspension of performances of Schmitt’s music in France. Despite this setback, Schmitt, who never stopped composing, came back to see two dozen late-career compositions premiered during the final decade of his life. Video footage of the composer from the 1950s, filmed at his home in St-Cloud, shows a still-active and spry elderly gentleman. Schmitt’s musical career culminated in the 1958 performance of the Symphony #2, his penultimate work, by Charles Munch and the French National Radio Orchestra at the Strasbourg Festival just a few months before his death. The composer had already achieved official redemption of his status as an elder statesman of French classical music by becoming the recipient of the Grand Music Prize of the City of Paris in 1957, in addition to having been named a Commander of the Légion d’honneur in 1952. For Ida Rubinstein, the war was more upending. As Paris fell to the invading German armies, she fled first to Algiers, and from there to Casablanca, Lisbon, and finally to London. Reprising her World War I role, Rubinstein cared for wounded Free French troops in England — all while residing at the fashionable Ritz Hotel in Piccadilly. 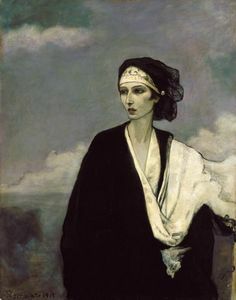 As her Paris home had been ransacked during the war — including the loss of her collections of rare books and artwork — Rubinstein elected not to return to Paris, but rather to move to Biarritz and later to her final home, Les Olivades, on the French Riviera near Nice. 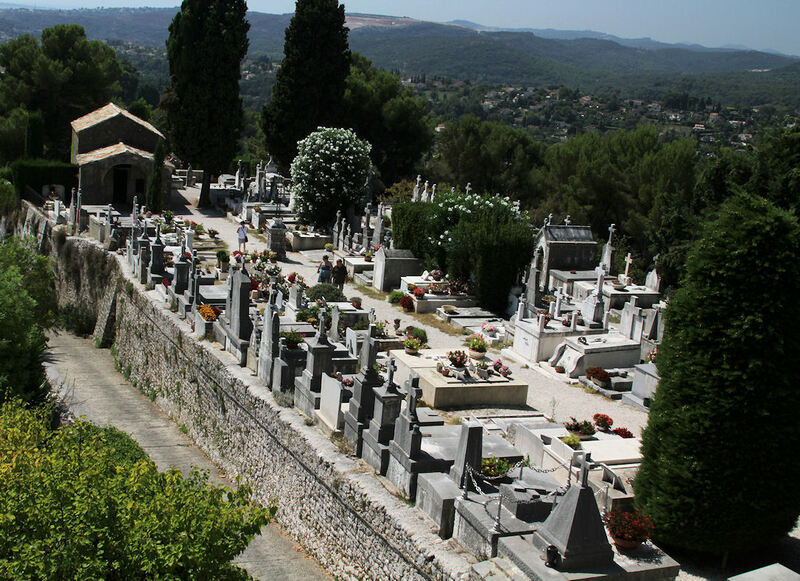 St-Paul de Vence cemetery, where Ida Rubinstein is buried. When Rubinstein died in 1960, it was nearly a month before her death was reported in the Paris newspapers. It was as if she had willed her own oblivion. Today, her grave in the south of France continues to be decorated by French veterans, who have never forgotten the service she gave to her adopted country over the decades. This entry was posted in Ballet, Classical Music, Composers, French Composers and tagged Antony & Cleopatra, Arthur Honegger, Ballets Russes, Cleopatre, Florent Schmitt, Gabriele D'Annunzio, Hugues Cuenod, Ida Rubinstein, Igor Stravinsky, JoAnn Falletta, Leon Bakst, Maison Worth, Maurice Ravel, Mikhail Fokine, Milhaud, Nicola Guerra, Oriane, Oriane et le Prince d'amour, Phedre, Racine, Salome, Scheherazade, Schmitt, Serge Diaghilev, Tragedie de Salome. Bookmark the permalink. A riveting account of the intersection of this artist and the composer(s) with whom she interfaced. Terrific, cutting-edge work. Thank you. It was a fascinating topic to research. Très impressionnée par ce site qui rend hommage à cette grande comédienne dramatique. Ma mère qui travaillait comme première main à la maison de couture Worth, a eu l’honneur de lui faire une robre, et un manteau avec un col de fourure dont elle était, chez ce grand couturier, spécialiste. Malheureusement, je n’ai plus les deux photos dédicacées par l’artiste (entre 1927 et 1932). Si quelqu’un possédait cette photographie en pieds de l’artiste , je souhaiterais en avoir une réplique virtuelle. En vous remerciant par avance. Thank you for your kind note and question. Can any readers assist Marceline Johnen in her request? Fantastic article. Beautifully done. Thanks for photos, music and clarity! Enjoyed this article immensely. There is an archive of her life and work at the Lincoln Center Performing Arts Library. It’s interesting how at the end of her life, she turns an inward eye as a religious recluse, after leading the most extroverted of lives … wondering now if she kept a diary.